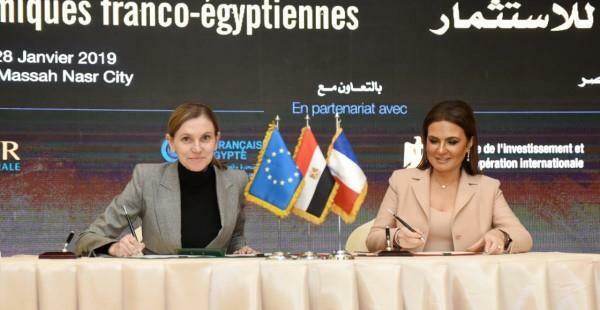 (MENAFN - Daily News Egypt) Across sector agreements were signed on Monday on the sidelines of French President Emmanuel Macron's first visit to Egypt. The numbers of agreements, letters of intent, protocols are over 30. Daily News Egypt published the details of the intergovernmental protocols, joint declarations and agreements between the Egyptian government and the French side, as well as the commercial cooperation between the French private sector and Egyptian companies. The Egyptian Military Medical Services Department affiliated to Egypt's Ministry of Defence signed with Sanofi Pasteur a MoU for cooperation discussions in the development of vaccination scientific knowledge, the development of an Egyptian National Immunisation Programme, and the supply and manufacturing of vaccine products in Egypt. Crédit Agricole Egypt inked a MoU with the Ministry of Social Solidarity for improving access to digital banking in remote areas. L'Oréal Egypt and the Ministry of Social Solidarity inked a MoU related to training female entrepreneurs. The ninth agreement was between Edison Egypt and Saint-Gobain Gyproc Egypt for a feasibility study and implementation of a cogeneration system of gas consumption on the group's industrial sites.